It was a long time coming, but finally DivX TV's web portal is live in the US—only on LG devices, mind you. 10,000 vids are available to watch on assorted Blu-ray players and home theater systems. The compatible models include the BD550, BD570 and BD590 Blu-ray players, and the LHB335, LHB535 and LHB975 home theater systems. Full details are below in the press release, but for me it's the Funny Or Dies videos which are the clincher. San Diego, CA – December 8, 2010 – DivX®, a division of Sonic Solutions® (NASDAQ: SNIC), today announced the launch of DivX TV™, the company's comprehensive entertainment service that enables retailers and consumer electronics manufacturers to bring a broad range of web-based content to home and mobile electronics. DivX TV offers a rapidly growing library of more than 10,000 high-quality videos and is capable of powering the distribution of any video content, including premium services. 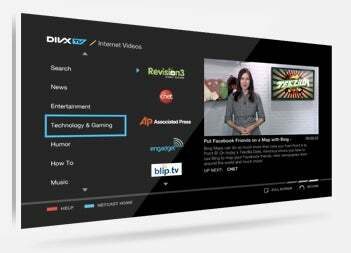 A one-stop shop for consumer electronics companies and retailers that want to provide on-demand access to popular Internet videos, original web programming, and customized content, DivX TV is easy to integrate into virtually any connected device at the chip level. The service can also be used to complement and enhance existing over-the-top content or application platforms. New York Financial Press (NYFP.tv) - Leading provider of premium video content reporting throughout the day from the floor of the New York Stock Exchange, the NASDAQ and Paris. Baeblemusic - Leading destination and producer of high quality exclusive music programming focused on the best emerging artists of today and tomorrow. Funny or Die - Award-winning, top destination for comedy with hundreds of exclusive celebrity videos and a steady stream of huge viral hits, Funny Or Die has become the "place to be seen" for comedic celebrities, and the obvious destination for a daily comedy fix. Howcast - Provider of high-quality how-to videos that empower the world with engaging, useful how-to content for daily life and enjoyment. Video Detective.com - The net's biggest library of movie trailers, from the newest releases to the timeless classics, plus DVD releases, video game trailers, TV promos, contests and more. OneScreen Media Exchange - Enabling branded channels for DivX TV across genres such as entertainment, health, cooking, and automotive with more to come. Small Business Television (SBTV.com) - Provider of valuable video news and informative feature segments to help small business owners manage, grow, and be inspired. UltraSlo - Slow motion film experience and window in our everyday world, captivating audiences and serving over 80 million videos online with its award-winning ultra slow motion and 3D film technology. DivX creates, distributes, and licenses digital video technologies that span the "three screens" comprising today's consumer media environment - the PC, television, and mobile devices. Over 350 million DivX devices have shipped into the market worldwide from leading consumer electronics manufacturers. DivX also offers content providers and publishers a complete solution for the distribution of secure, high-quality digital video content. Driven by a globally recognized brand and a passionate community of hundreds of millions of consumers, DivX is simplifying the video experience to enable the digital home. For more information, visit www.divx.com.